^ a b c d e f g h OECD 2013. ^ ﻿医療給付実態調査 平成24年度﻿ (Report). 厚生労働省. (2014-04-08). GL08020101. http://www.mhlw.go.jp/stf/seisakunitsuite/bunya/iryouhoken/database/zenpan/iryoukyufu.html. ^ ﻿Government at a Glance﻿ (Report). OECD. (2015). doi:10.1787/22214399. ^ a b c OECD 2015, p. 128. ^ a b OECD 2015, p. 129. ^ a b c d e f g h i j k l m 厚生労働白書 2011, Chapt.3. ^ a b 財務総合政策研究所 2010. ^ World Health Organisation, World Health Staff (2000). Haden, Angela; Campanini, Barbara. eds. The world health report 2000 - Health systems: improving performance. Geneva, Switzerland: 世界保健機関. ISBN 92-4-156198-X. http://www.who.int/whr/2000/en/whr00_en.pdf. ^ a b c d OECD 2009, p. 99. ^ a b OECD 2013, Chapt.1.9. ^ a b WHO 2013, pp49-59, Part3 Grobal health Indicators>1. 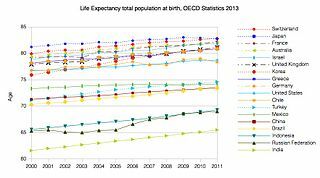 Life expectancy and mortality. ^ a b ﻿World Health Statistics 2010﻿ (Report). WHO. (2010). pp,45-57, Part2 Grobal health Indicators>1. Mortality and burden of disease. http://www.who.int/gho/publications/world_health_statistics/EN_WHS10_Full.pdf. ^ ﻿平成24年 人口動態調査, 第7表﻿ (Report). 厚生労働省. (2013-09-05). http://www.mhlw.go.jp/toukei/list/81-1.html. ^ WHO 2013, pp.61-71, Part3 Grobal health Indicators>2. Cause-specific mortality and morbidity. ^ ﻿人口統計資料集 2013年度版﻿ (Report). 国立社会保障・人口問題研究所. (2013). Ⅴ．死亡・寿命. http://www.ipss.go.jp/syoushika/tohkei/Popular/Popular2013.asp?chap=5&title1=%87X%81D%8E%80%96S%81E%8E%F5%96%BD. ^ ﻿Making Mental Health Count The Social and Economic Costs of Neglecting Mental Health Care﻿ (Report). OECD. (2014-07). doi:10.1787/9789264208445-en. ^ a b c d e f OECD 2015, Assessment and recommendations. ^ a b c d e f g “日本の公的医療制度の課題と民間医療保険の可能性”. フィナンシャル・レビュー (財務総合政策研究所) 111. (2012-09-01). http://www.mof.go.jp/pri/publication/financial_review/fr_list6/fr111.htm. ^ a b OECD 2013, Chapt.4.3. ^ a b OECD 2013, Chapt.3.1. ^ a b c WHO 2013, pp120-129 >Part3 Grobal health Indicators>6. Health Systems. ^ a b OECD 2013, Chapt.3.7. ^ 厚生労働白書 2013, p. 305. ^ 厚生労働白書 2013, 資料編 pp.44-45. ^ a b OECD 2009, pp. 106. ^ a b c d OECD 2009, pp. 126-128. ^ ﻿平成24年版厚生労働白書﻿ (Report). 厚生労働省. (2012). pp. 363. http://www.mhlw.go.jp/wp/hakusyo/kousei/12/. ^ a b c ﻿平成28年度 国民医療費の概況﻿ (Report). 厚生労働省. (2018-09-21). https://www.mhlw.go.jp/toukei/saikin/hw/k-iryohi/16/index.html. ^ 厚生労働白書 2013, 資料編 pp.21-22, 詳細データ1　社会保障給付費の部門別推移. ^ 厚生労働白書 2013, 資料編 pp.33-34, 詳細データ3　国民医療費及び構成割合の推移. ^ a b c WHO 2013. ^ a b OECD 2015, pp. 131-132. ^ a b c OECD 2009. ^ OECD 2015, p. 126. ^ a b c OECD 2009, p. 118-119. ^ a b c ﻿社会保障制度改革国民会議 報告書（概要）﻿ (Report). 社会保障国民会議. (2013-08-05). http://www.kantei.go.jp/jp/singi/kokuminkaigi/pdf/houkokusyo_gaiyou.pdf. ^ ﻿Revenue Statistics 2014﻿ (Report). OECD. (2014). doi:10.1787/rev_stats-2014-en-fr. ^ a b c OECD 2009, p. 119. ^ a b c ﻿社会保障国民会議 最終報告﻿ (Report). 社会保障国民会議. (2013-11-04). http://www.kantei.go.jp/jp/singi/syakaihosyoukokuminkaigi/. ^ a b c d e f OECD 2009, pp. 123-126. ^ “混合診療及び保険外併用療養費制度が医療制度に与える影響に関する研究”. フィナンシャル・レビュー (財務総合政策研究所) 111: 56-57. (2012-09-01). http://www.mof.go.jp/pri/publication/financial_review/fr_list6/fr111.htm. ^ a b OECD 2013, 4.11. ^ a b c d OECD 2015, pp. 128-130. ^ a b OECD 2009, pp. 115-116. ^ 厚生労働白書 2013, pp. 308-309. ^ a b c d e OECD 2009, pp. 113-115. ^ OECD 2015, p. 131. ^ a b c “民主党政策集INDEX2009 - 医療政策” (プレスリリース), 民主党, (2009年7月23日), http://www1.dpj.or.jp/policy/koseirodou/index2009_medic.html, "レセプトオンライン請求の原則化"
^ “医療費の総額管理制度の導入をどう考えるか”. みずほリポート (みずほ総合研究所). (2005-08-24). http://www.mizuho-ri.co.jp/publication/research/pdf/report/report05-0824.pdf. ^ a b 厚生労働白書 2013, pp. 310. ^ a b OECD 2009, pp. 116-117. ^ a b c d e f OECD 2009, pp. 117. ^ a b c d e “Japan: Universal Health Care at 50 Years”. ランセット 378 (9796): 1049,. (2011). doi:10.1016/S0140-6736(11)60274-2. PMID 21885103. http://download.thelancet.com/flatcontentassets/series/japan/series3.pdf. ^ a b c d OECD 2009, pp. 106-108. ^ OECD 2009, p. 105. ^ a b c d e f g h i j k l m OECD 2009, p. 118. ^ OECD 2009, p. 33. ^ ﻿柔道整復師の施術に係る療養費の支給について﻿ (Report). 会計検査院. (2009). http://report.jbaudit.go.jp/org/h21/2009-h21-0357-0.htm. ^ “柔道整復療養費にメス？ 厚労省が不正請求への対処に本腰”. 日経メディカル. (2012-07-10). http://medical.nikkeibp.co.jp/leaf/mem/pub/report/201207/525775.html. ﻿「医療制度の国際比較」報告書について﻿ (Report). 財務総合政策研究所. (2010-06-30). http://www.mof.go.jp/pri/research/conference/zk087.htm. ﻿World Health Statistics﻿ (Report). WHO. (2013). http://www.who.int/gho/publications/world_health_statistics/en/. ﻿OECD Reviews of Health Care Quality - Japan﻿ (Report). OECD. (2014). doi:10.1787/22270485.